If you've been waiting for the opportunity to get your hands on Onyx's new 6.8" ereader, here's your chance. 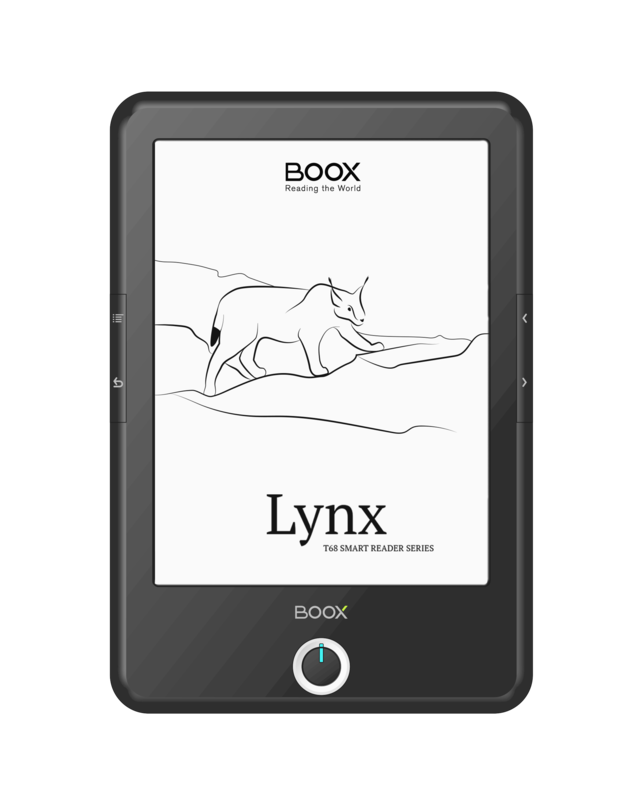 Arta Tech, Onyx's retail partner in Poland, is taking pre-orders for the Boox T68 Lynx. The list price is 143 euros plus VAT and shipping, and the Lynx is expected to ship after 9 June. Onyx has been teasing us with glimpses of the Lynx since October 2013, and so far this ereader looks like everything the Aura HD could have been. The Boox T68, or Lynx, sports a 6.8" screen with frontlight and touchscreen. It runs Android 4.0 Ice Cream Sandwich on a 1GHz CPU with 512MB RAM, 4GB internal storage, and a microSD card slot. And with a screen resolution of 1440 x 1080, the Lynx has the sharpest of any commercially available E-ink screen. This ereader is more of a tablet than anything. It runs Onyx's own reading software but it also ships with a full Android, including the option to install apps from Google Play. It also has Bluetooth, Wifi, a headphone jack, and TTS provided by the specialists at Ivona. The price plus shipping to the US is around $250, making this ereader more expensive than all other ereaders and even a lot of tablets, but it's a price I am willing to pay. I bought one. I know that's a lot to spend on an ereader sight unseen, but as you can see in the following demo video (found via my competition) it is an impressive device. is there any chance that it will be arrive in North America so we can cut down the shipping fee? is this the exactly the same piece of hardware as china retail model? I don’t know, but I will check to see if there’s a problem with the touchscreen. Got a link to those reports? Thanks! I thought it had only half that much RAM. You’re right, it does. I must have put 1Gb reflexively. Thanks! 4.0 jelly bean? I think you have to decide for one of it.. 4.0 is named ice cream sandwich and jelly bean would be 4.2..